The Legacy Center is proud to announce the addition of a new baseball and softball complex that is set to open Spring 2017. This new state of the art facility will bolster six multi use playing surfaces that will be made up of four fields with extending fence lines as far as 250 feet, a premier little league field and a collegiate regulation baseball stadium. Each field will be host to premium amenities that will eventually include team dugouts, covered spectator bleachers and live web based video feeds. 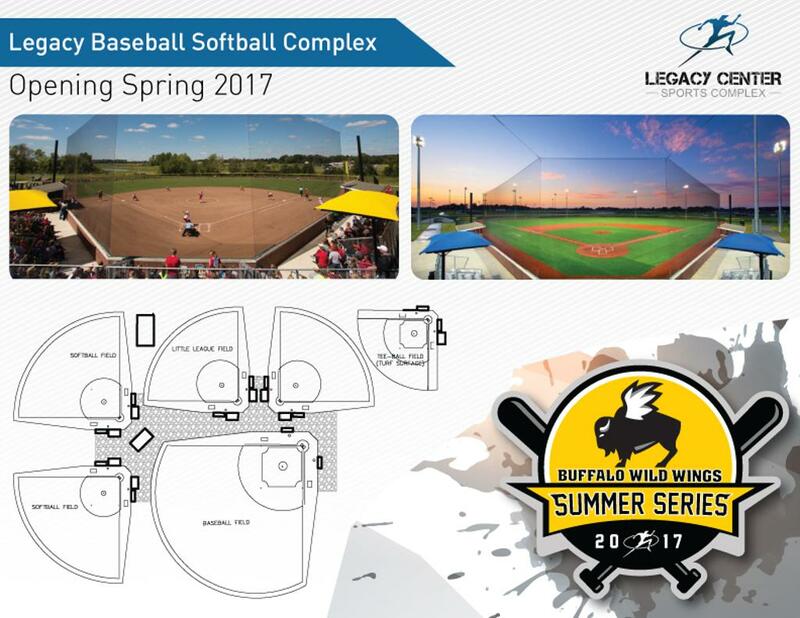 The facility will kick into full gear this summer with the Buffalo Wild Wings Summer Series that will offer a dynamic tournament circuit for baseball and softball teams alike. In additional to bringing new events to the community, the complex will also be home to the Legacy Baseball & Softball Organizations. These Legacy based clubs offer recreational and elite levels of competition for athletes of all ages and skill sets. Teams within the Legacy Community will have the first opportunity to practice and play on the new surfaces starting in June. When asked about what this development means to both organizations, Director of Baseball, Ryan Ford, commented, "It's an opportunity to take our off season training outside in live competition on our own campus. We are very excited to provide a great experience for tournaments, leagues, and practice for our own teams. Our goal is to take our athletes to the next level and we believe having access to facilities such as these will allow us to do so." The new facility will be topped off with 250 additional parking spots that will also include a designated drop off area for added athlete safety. The complex is approved for game play lighting, but the addition of these fixtures will be determined at a later date. “The Legacy Team is excited to continue to live out our mission of providing a world class experience in a year round, multi sport environment.” Rodney Goble, Managing Partner of the Legacy Center had to add about the project. This newest expansion will be the third phase of the Legacy Center project that already includes a Dome facility, Field House, 7 outdoor multi sport fields, fitness center and 15,000 sq ft baseball/softball training center. Future expansions will include outdoor sand volleyball courts, medical wellness/community fitness center and a basketball/volleyball field house.